Women always like to look younger and if you are not an exception then you can try the pixie hairstyle. The hairstyle should be proper to get a younger look. The pixie hair styles not only make your look cute and younger but also hide the thin volume of your hair. This hairstyle is loved by the most of the women because of its messy look and stylish appearance. If you want to get an attractive facial shape then also these pixie hairstyles in various ways can fulfill your desire. The popular Pixie Hairstyles for Women over 50 are easy to follow and manage. So, you can prefer this style to stay comfortable yet noticeable in the crowd. You can highlight the strands of the hair to get more attractive appearance. This modern style is suggested by the hair experts to the middle-aged women who love to wear modern and casual dresses. The hairstyles are very important to maintain when you want to get a complete and perfect look. Choosing the right hairstyle according to your age and appearance is important and you need to keep this point in your mind. If you are finding a way to look smart and bold in the middle of the age then, you need to follow which pixie hairstyle suits you properly. Here you will get a list of pixie hairstyles and from this lot you can select one as per your choice. The short haircuts are always younger looking and this Feathered Pixie Cut is not exceptional as well. You can make it more interesting by adding some Wispy bangs in the front. The short and trimmed hair with uneven ends leaves a messy look on your face. This haircut looks perfect with sharp edge in the side parted pattern. The length of the backside of the hair up to your shoulder is cut in shorter length than the front side. The wispy bangs in the front of the head can be parted on one side. The casual pixie cut can give you a bold look. The sharp ends of the hair in this style make your appearance more prominent and remarkable in the crowd. This style is perfect for the women who have straight hair. This style makes the shape of your shape prominent. The uneven and longer hair strands in the front side on the forehead makes your look smart. The hair on the top of the head is needed to cut into shorter length. If you have curly hair in short length, then the Natural Short Tight Curls can be the ideal style for your hair. The natural curls are cut in very short length in this style up to your shoulder. The messy curls over your hair can give you a stylish and comfortable appearance. This is another stylish hair cut that can hide your age and thin hair volume. In this style, you need to back brush the middle portion of the front hair. The highlighted hair in golden color makes your appearance more prominent. The hair length remains up to your shoulder in the back side. If messy hair styles attract you then Curly and Tousled Pixie Cut is the perfect choice for you. The sharp edges of the hair make the style more prominent. The curly hair in tousled pattern makes your look more stunning and modern. The hair up to your shoulder on the backside of your head can be managed easily. You can use some hair gel to hold the hair uplifted. Women who are at the age of 50 can select this style to look modern and bold. When you are going to attend a party, you must want to look gorgeous in the crowd. The Swept Back Blonde Hair can fulfill your desire rightly. The combination of these two colors on your short length hair makes your appearance smart and classy. The uneven lengths of the hair in this style are also perfect to make your appearance remarkable in the crowd. You need to back brush your hair well to look classy. If the short length hairstyle suits your personality then Razor Cut Bangs can be a good option for you. This hairstyle helps you to get a round facial shape. This style with sharp and prominent hair edges can make your facial shape more prominent. In this style, you can manage your hair easily and it makes you look perfect at the age of 50 as well. The short hair in razor cut makes your look modern and stunning. The sharp edges of the hair are its specialty. 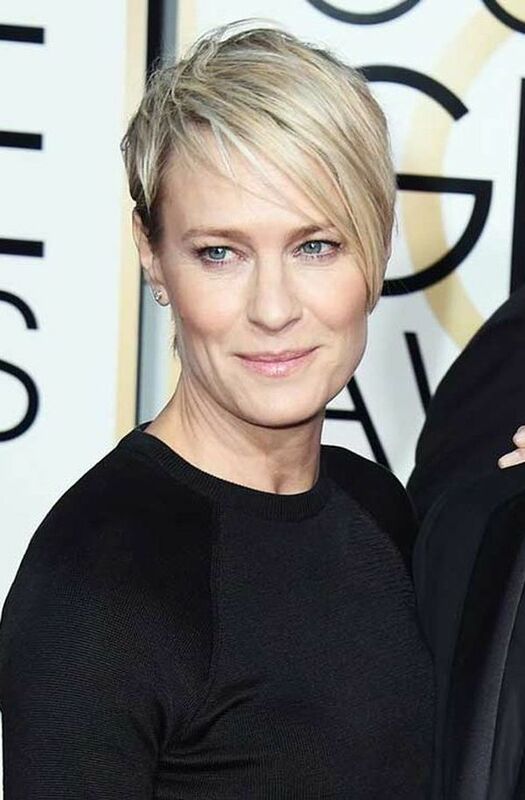 The combination of Asymmetrical Cut and Bangs is a correct choice for the women who want to look stunning at the age of 50. In this style, the hair is parted from one side. The lengths of the hair remain asymmetric. The longer bangs on the front of one side hair make your appearance classy. The bangs of the front side of the hair are cut up to the length of the ears. The uneven and sharp ends of the hair make the style remarkable and prominent. This is another hairstyle that suits the women who are crossing their middle age. The short length hair is flipped up in this style to hide the volume of the hair. This style leaves a bold yet sober look on your face. This style suits well on the curly hair. The curly ends of the hair make the style not only unique, but also very prominent and unique. This is another pixie haircut for the women who love to look like tomboy. This style is perfect on the short hair which is cut up to your shoulder. The uneven strands of the hair slightly make your look messy. In this style, you can not only hide your hair thinness at the middle age, but also represent an interesting personality. Bob cut hair always makes your look young and cute. You can combine it with pixie cut and bangs. The pixie hair cut up to your shoulder in bob style looks perfect on the straight hair. The side parted hair with uneven front side bangs makes the cut unique and gorgeous. You can hide your age by choosing this young-looking hairstyle. It can also hide the wide foreheads of the middle-aged women. Women with straight hair can go for Shag Rich Haircut which looks best with Rich Caramel Highlights. In this style, the sharp ends of the hair on your forehead and backside of the head up to your shoulder can keep your look gorgeous in the crowd. This hairstyle in caramel highlights makes your appearance attractive in the gathering. In this bright hair pattern, your hair looks shiny as well. Women who are crossing the age of 50 can select the Short Blonde Spiky Haircut. The hair is cut in short length up to your shoulder. The hair on the backside of the hair is cut in shorter length and the hair of the middle portion of the head is styled in spiky manner. The blonde color of the hair in this style makes it not only stylish but also unique and prominent at the same time. If you like undercut hairstyles then Side Parted Short Bob with Asymmetrical Shaved Undercut can attract you. The hair looks good in white color in this style. The undercut hair on one side makes it interesting. This style looks perfect on the straight hair and you can manage this style easily as well. The undercut hair from shorter to longer length on one side makes your appearance unique in the crowd. This turns your look into a classy one. Women with straight hair can select the Blonde Bowl Cut. In this style, your hair is cut up to your shoulder. The longer hair on the front side of your forehead makes your look more interesting and smart. The side parted style is perfect in this haircut. This style is perfect to hide the middle age of the women. The blonde color of the hair makes the style more unique and perfect. These hairstyles are popular in the modern world and you can pick any from these styles to look most beautiful in the crowd. These combine hairstyles are especially designed by the experts for the women who are crossing their middle age. In these short and pixie hairstyles, you can get the perfect appearance.